Play Fruits And Clovers: 20 Lines Slot Online with 500 Free Spins! Fruits And Clovers: 20 Lines is a UK Online Slot Game by Playson. This 5-reels, 20-betways game has an RTP of 96.51%. Fruits And Clovers slot has the Scatters triggering Free Spins and major main game features. Garnish your fresh fruit salad of many chances to win real money with lucky shamrocks, as Fruits And Clovers: 20 Lines slot game is sure to get your exciting juices flowing. The beautiful green background and four leaf clovers that appear on the reels hints that Fruits And Clovers: 20 Lines slot game has an Irish theme. The reels themselves are in a simple and elegant style, without any distractions of animations or other flourishes, so you can easily focus on the gameplay itself. In this sense, Fruits And Clovers: 20 Lines online has a classic slot quality with a modern upgrade and this is particularly emphasized in the retro fruit symbols. High to medium value symbols include lucky red 7s, a watermelon, and a bunch of purple grapes. The lucky four leaf clover acts as a Wild and there is also a gold star Scatter symbol. Of lower value are other fruits of a lemon, an orange, and cherries. Visually, Fruits And Clovers: 20 Lines slot impresses with bright and colourful 3D graphics that literally burst from the reels with the darker green background. Each symbol, when they form a winning combination, creatively has its own animated effect. For example, the watermelon will catch fire with exciting flames or the Lucky red 7s will sparkle with golden halo. Staying faithful to the old school retro slot quality, there is no background music. However, this is more than made up for with the magical chimes and jingles that highlight wins and are sure to fuel your excitement during gameplay. Hitch the leprechaun tractor to the Rose Slots orchard in Fruits And Clovers: 20 Lines slot, where lucky shamrocks grow amongst the fruits and you may even find a pot of gold rewards under a rainbow. Letting you become a shamrock fruitarian in Fruits And Clovers: 20 Lines slot is one of the best and most recognizable online casino games designers, Playson. With its headquarters in Malta, Playson has consistently released innovative creations that showcase detailed and colouful graphics, fun and engaging themes, straightforward gameplay, and bonus rounds with many potential rewards on offer. Fans of online casino UK can discover a whole range of other Playson titles such as ‘100 Joker Staxx’, ‘Mighty Africa’, ‘Crystal Crush’, ‘Chicago Gangsters slot game’, ‘Sevens & Fruits: 20 Lines’, God of Wild Sea’, and ‘Viking Gods: Thor & Loki slot’. 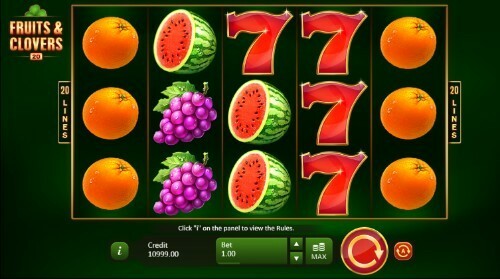 The fruit always stays fresh and colourful as Fruits And Clovers: 20 Lines online slot has a very straightforward, engaging, and easy to understand gameplay. This is largely due to the classic slot style of gameplay, which does not try to continually dazzle with fancy animations or intricate features. It is the type of slot whereby what you see is what you get, and you may be getting quite a lot on any given spin of the reels. With 5 reels, 3 wager rows, and (as contained in the slot’s name) 20 ways to win, you may be squeezing all the juice from the rewards into a jackpot smoothie. Now that would surely be refreshing. The Wild four leaf clover substitutes for all other paying symbols, except the gold star Scatter, to award wins. When 5 of the four leaf clover Wild grows on the reels, you will certainly be calling them lucky charms with up to 7,500 coins on your initial bet. This is, however, far surpassed if you get to wish upon 5 of the gold Star Scatters on the reels. At maximum bet, you will yourself feel like a star and sham’rock’ out to an incredible jackpot of 40,000 coins on your total wager. That is definitely a thick layer of green icing on the fruit cake. Regarding the other symbols, 5 of: Lucky red 7s awards up to 1,800 coins, watermelons and bunch of grapes rewards up to 800 coins, and lemons, oranges, and cherries will offer you up to 450 coins. If you ever forget the payout amount, simply click on the symbol to reveal its paytable value. Wagering in Fruits And Clovers: 20 Lines online slot game has a flexible range of 20p to £100. By clicking the ‘Bet’ button beneath the reels, you can easily select a specific wager. This allows you to create a betting strategy as the lower betting only increases by 20p whereas higher bets jump by £20. If you need to recharge with a fruit smoothie, conveniently set the AutoPlay button for 5 to 999 continuous spins. There is also a QuickSpin slider for faster gameplay or a QuickStop which halts the reels when the spin button is pressed again when the reels are in motion. While at the Irish fruit stand, you can even enjoy Fruits And Clovers: 20 Lines online as it is fully compatible and nicely designed as a mobile slot as well as on other devices like desktop and tablet. While this slot is very basic, there are high paying symbols and the theoretical RTP is estimated at 96.31%. This classifies the game in the area between medium and high variance, meaning that you are less likely to receive frequent small payouts but when you do win they are more likely to be much greater. As t Fruits And Clovers: 20 Lines online is a traditional, classic slot there are not any usual bonus rounds as with other titles – such as Scatters triggering Free Spins or major main game features. However, the four leaf clover Wild can appear stacked on the reels on any random spin. Stack Wild dramatically increases your chance of winning major rewards. The other aspect of Fruits And Clovers: 20 Lines slot that deserves re-emphasizing is the Scatter jackpot when 5 gold stars twinkle on the reels. An award of 40,000 coins on your initial bet is sure to launch you excitedly into the sky and you will become a shooting star. Do not underestimate the simple style of this slot or the lack of bonus features, as a major win like that (and for the other symbols as well) certainly packs an impressive fruit punch.